Now that the weather has turned cooler and the rowing season is over, I’ve gone back to running outdoors, which is my usual exercise over the winter (unless it gets so cold that I run on the indoor track at the Rec Center instead). When I went to the park to run five miles with my husband on Sunday, the thought of having to wait till spring to get back out on the river felt kind of sad, with the long cold winter ahead. But then it occurred to me that instead of feeling gloomy and looking at my winter workouts in the same light as doing chores, I should appreciate the opportunity for quiet reflection. While running along the park trail, I found myself thinking about pilgrimages such as the Camino de Santiago in northern Spain, which has been traveled since the Middle Ages. Even today, many people walk the Camino to put their worldly concerns in perspective and to gain spiritual growth. There are various starting points; one of the popular routes, beginning at the French border, is about 800 kilometers. ¡Buen camino! 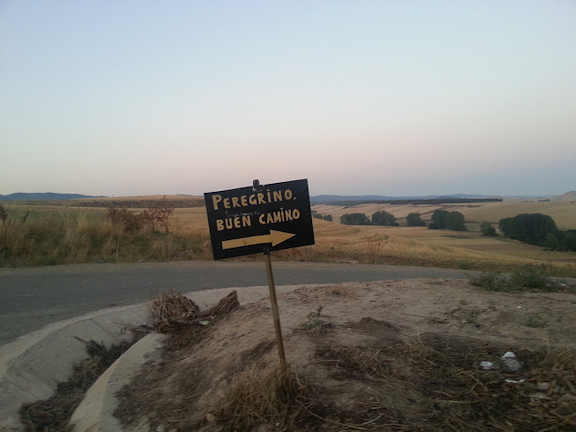 is the customary greeting for peregrinos (pilgrims), wishing them a good journey. So I decided that when I run in the park this winter, I’m going to imagine myself making progress in short segments along my own personal Camino and leaving my complaints and ungrateful attitudes behind. I know that many of us are working to improve ourselves in similar ways, as well as to promote a spirit of kindness and grateful reflection in the community; so today I’m wishing all of my fellow pilgrims, as we travel along this road, ¡Buen camino!